14 - 19 June. 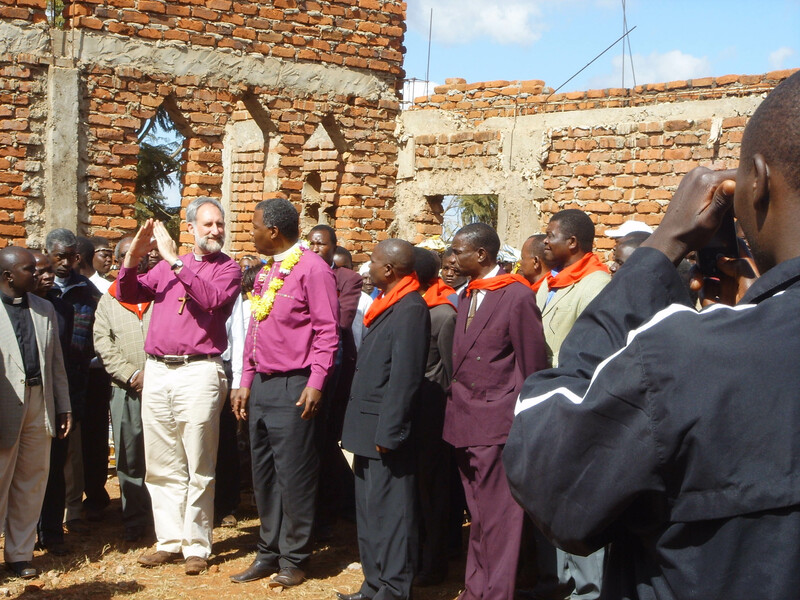 Six days based in Kuchijinji, the Diocese of Niassa HQ in Lichinga with Bishop Mark and Helen, coinciding with the visit of Archbishop Thabo Makgoba, the Anglican Archbishop of Cape Town and Metropolitan of the Anglican Church of Southern Africa. 20 June. Travelled by car to Cuamba. Arrived at St Marks at around 7pm. With Helen as our guide, we visited the training centre for catechists, lay readers and mission leaders. 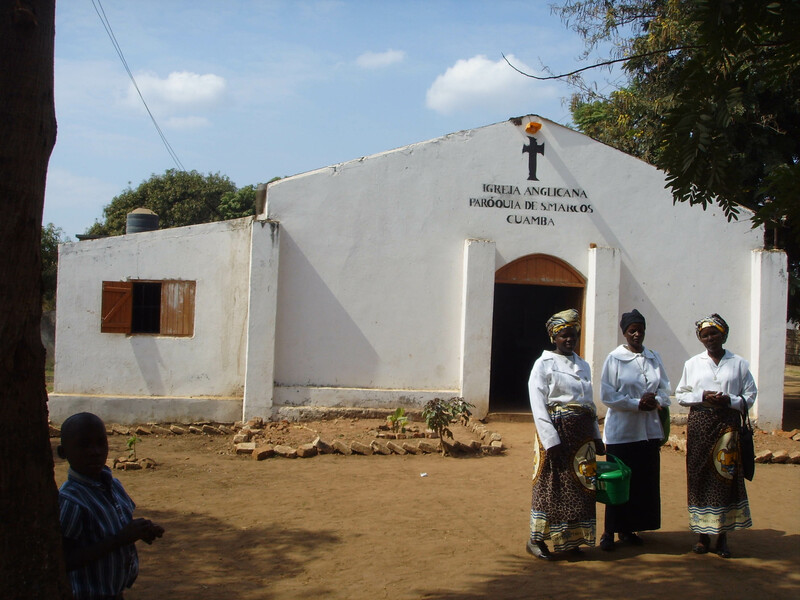 Helen gave us an overview of the church situation in Niassa and the wider area of the Anglican Church in Southern Africa. 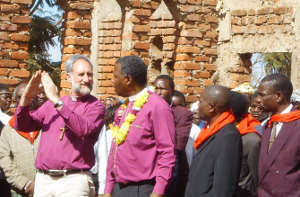 We joined in with preparations for and the celebration of Archbishop Thabo Makgoba’s visit to Niassa with Eucharistic services in a sports stadium in Lichinga and at the Cathedral in Messumba, at the lakeshore of Lake Niassa. We met Fr Cosme, the priest at St Mark’s Cuamba, for the first time as he was in Lichinga for the celebrations. Here we also met our two translators for the trip, Rosa and Fernando. 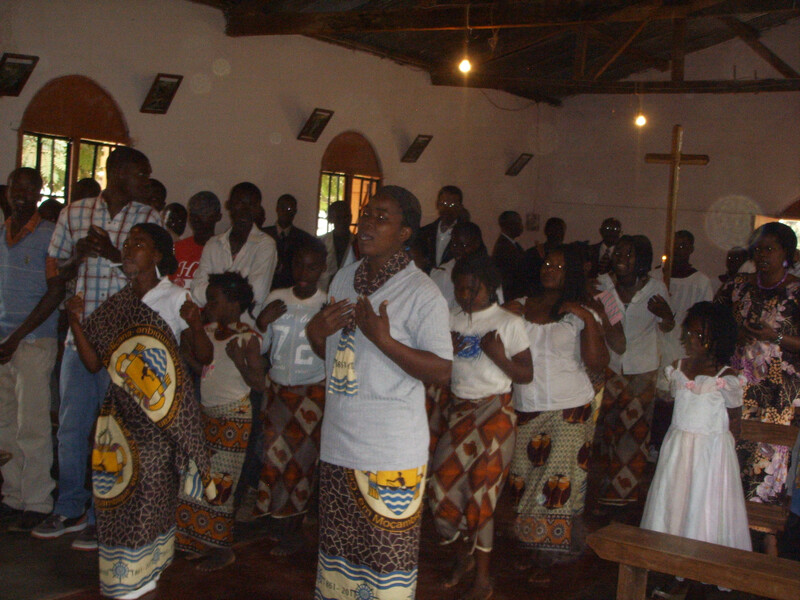 Rosa took us to a Eucharistic service at her church in Kuchijinji where we met with the Mother’s Union. We spent a couple of mornings with members of the MU, visiting and praying for the sick in several villages in Lichinga, and leading a Bible study. The church warden from St Mark’s Church, Mr Deuasse, drove us in his car from Lichinga to Cuamba, arriving at around 7pm. We were warmly greeted by a crowd singing to welcome us. We soon discovered that much preparation taken place in anticipation of our visit. Jenny and Claire were accommodated with a church family, Thomas, Angela and Scarletti, in a very nice house, although it had no running water inside. Olyve had a room in an office block just round the corner. The arrangement worked out very well. We stayed together the whole time except at nights. The church had organised a rota to help Angela cook for us – three cooked meals a day, and lots of bottled water, Coke and Fanta. Our impression of Cuamba was that generally the population are financially and materially very poor. Very few homes have running water. Water is collected either from wells or street taps. We saw extreme poverty, especially in the smaller villages we visited, but there did not appear to be a lack of basic food and water. There are a few shops, selling household items, toiletries and bicycles and there are several small markets. There were no souvenirs to buy in Cuamba! We found the church to be fervently high Anglican, though they are a minority in a town where most are Roman Catholic. Generally the Anglican churches are located on the edges of town and seemed to be poorly resourced. We were not given the opportunity to visit any Roman Catholic churches. 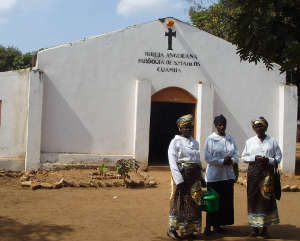 Jenny presided and preached on three occasions, twice at St Mark’s and once at the church in Macaue. The services were conducted in local languages. Whilst the liturgy and lectionary were the same as in the Church of England, the singing and dancing during the services gave us an unforgettable cultural experience. Fr Cosme and his wife, Flora have two sons, Nathanial (9) and Jose (7), with another one on the way. Their home is extremely basic, with very little furniture, and there are lots of holes in the tin roof. They have no running water. In the evening we met with members of the PCC. Through these two meetings we were able to find out much more about St Mark’s and together we tried to establish the hopes and expectations of both St Mark’s and St Pancras for the link parish project. On our final Sunday in Cuamba we were presented with gifts for ourselves and a splendid wooden model of the St Mark’s as a present to St Pancras Church. We were also given a letter from St Mark’s PCC, read aloud to the church by Mr Deuasse, to the PCC of St Pancras, documenting the history of our link so far, and their aims and objectives for future church projects. It is their hope that St Pancras Church will help towards funding these ventures. In our conversations, formal and informal, during the course of the week, we talked about a balanced exchange between churches, so we would know each other as brothers and sisters in Christ, pray for each other and learn from our different cultures and experiences. We were very well entertained during our stay. 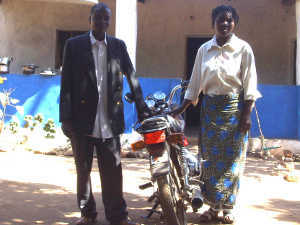 Mr Deuasse is a wealthy businessman to whom we were very grateful for driving us, not only from Lichinga to Cuamba, but also on a day trip to the church in Mecanhelas, to the village of Macaue, and to Nampula. We paid for the petrol on these occasions. We visited his resort and farm called “Quinta Timbwa”, where he organised a lavish party for us and some members of the church. Another ‘bring and share’ party was arranged for the whole church on Sunday afternoon. Other meetings included representatives of the Mothers Union in St Mark’s, the youth, the young girls’ St Agnes group, the choir and a Team of Life representative. With Cosme and Flora, we visited and prayed for sick parishioners in their homes. Throughout our trip, on the relatively few occasions when we ate out in cafes or restaurants, we took the opportunity to pay the bill. However, it would have been inappropriate to pay for our accommodation and food provided so generously by our hosts. We regretted not taking more small presents which could easily have fitted into our luggage, e.g. postcards, CDs and DVDs to give an idea of life, particularly church life and music in London. An English prayer/service book would have been useful. Besides our two translators, we found one or two people who spoke some English, including Fr Cosme and the Deputy Churchwarden, Betty Raunde. 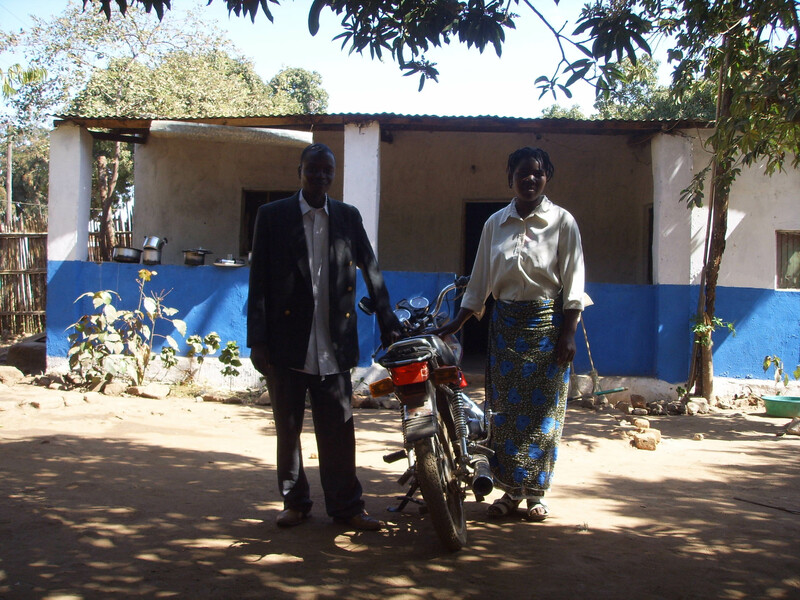 Through her job, Betty has access to a computer and the internet. Far greater knowledge of Portuguese on our part would have been very useful. Fr Cosme was extremely pleased with his stole, his camera and solar recharger. Our original plan was to take the train from Cuamba to Nampula. It was made very clear to us that we should buy 2nd class tickets and to avoid 3rd class (there doesn’t seem to be a 1st class). However, on learning that there were no 2nd class compartments on the day we needed to travel, we were fortunate to be offered plan B – Mr Deuasse took us to Nampula in his car. 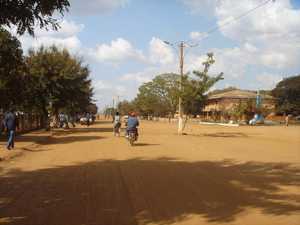 Nampula is a much bigger town where we saw tarmac for the first time since our arrival in Mozambique. Here we stayed in a very nice hotel, ate in the Copacabana restaurant and shopped for souvenirs.